This return address label design finds a way to be both clean-cut and totally cute. Two pretty pink hues are separated by a graceful white curve that elegantly swoops across the corner. Choose this style to give your letters and packages a splash of colorful personality that is still polished and professional. What you'll love most about these labels is that they are self-adhesive. Just stick them on all your outgoing mail for a simple solution to the hassle of filling out envelopes. 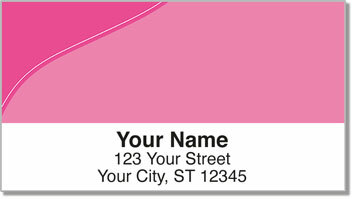 Get your very own Pink Curve Address Labels right now! Not into pink? That's okay - we've got several other options including a set with four different colors.